To do so, the Betz team took a new approach in evaluating its wines. In previous years, each barrel received an evaluative score that was used to assess quality. Starting with the 2012 vintage, Griessel, winemaker Bob Betz, and assistant winemaker Tyson Schiffner also subsequently rank ordered each barrel. Both numbers were subsequently used as quality cutoffs. 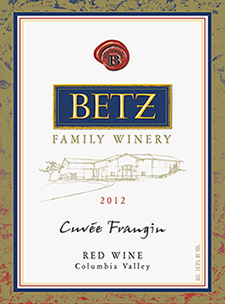 Declassified barrels were subsequently used to craft a new wine, the Cuvée Frangin (pronounced ‘Frahn-JEN’), meaning ‘little brother’ - “In an affectionate way!” winemaker Bob Betz said of the name. This blend of Merlot, Syrah, Cabernet Sauvignon, and Petit Verdot comes in at a lower price point than the winery’s other offerings, making it particularly appealing on-premise. “You’ll have a Betz wine that will sell for $33 (retail) on a wine list,” said Griessel. The results are immediately apparent in both the 2012 Rhone wines reviewed below as well as an early look during my visit at the 2012 Bordeaux wines, which will be reviewed upon release. Both sets of wines were stunning, a tribute to both the new approach and the strength of the vintage in Washington. In other news, assistant winemaker Tyson Schiffner will be leaving the winery at the end of this month. Schiffner, who made beer at Red Hook for close to seven years before turning his attention to wine, will return to his roots to help start Sumerian Brewing Company in Woodinville. All wines sampled at 62 degrees. (Excellent) The aromatics bring you immediately to Bordeaux where it might pass in a blind tasting for Saint-Émilion Grand Cru. There are complex notes of thyme, cedar, green herbs, blueberry, char, savory notes, tilled soil, and barrel spices. The palate is tart but with richness to the fruit flavors and a long finish. 67% Merlot, 28% Cabernet Sauvignon, 5% Petit Verdot. 35% Red Mountain, 35% Horse Heaven Hills, 30% Yakima Valley. 14.1% alcohol. (Excellent/Exceptional) Locked up aromatically with mocha, dark cherries, ground herbs, tar, anise, and dark cherries. The palate has a sense of viscosity and richness with beautifully balanced acidity. A very pretty wine with a high Yum Factor. 87.5% Cabernet Sauvignon, 9.4% Petit Verdot, and 3.1% Merlot. 69% Red Mountain, 20% Horse Heaven Hills, and 11% Yakima Valley. (Excellent/Exceptional) An aromatically appealing wine that is simultaneously complex and direct with a potpourri of fruit - black cherry, black currant, and plum – along with floral notes, smoke, sweet spices, and herbs. It’s fruit filled, rich, and direct with a supple feel and soft tannins. 36% Merlot, 26% Syrah, 23% Cabernet Sauvignon, and 15% Petit Verdot. 48% Red Mountain, 40% Yakima Valley, and 12% Horse Heaven Hills. 14.3% alcohol. (Excellent/Exceptional) Dark in color. Pops aromatically with plum, white pepper, garrigue, a light meatiness, and dark raspberries on a profile that at first blush you might almost mistake for a wine from Châteauneuf-du-Pape. It’s a rich, mouthful of a wine with great depth of fruit flavors and a textured feel. 50% Grenache, 20% Cinsault, 15% Mourvèdre, and 15% Syrah. 14.7% alcohol. (Exceptional) An aromatically alluring wine with chocolate, smoke, tar, graphite, blackberry, and gravel. The palate is dense, textured, and richly flavored, absolutely shimmering with intensity. As good if not better than any La Serenne the winery has made to date. Still drinking young, Give some additional time in the bottle or decant. 14.3% alcohol. (Exceptional) Pops aromatically with dark plum, blackberry, dried earth, anise, roasted coffee bean, and mineral. It’s full bodied, ripe, and luscious. A ‘wow’ wine with surprisingly supple tannins. Just a baby now, put this one deep in the cellar. 56% Ciel du Cheval, 44% Kiona. 14.2% alcohol. 14.2% alcohol. (Exceptional) Dark in color. A brooding wine with notes of blueberry, plum, earth, and mineral. The palate is densely packed with rich fruit flavors supported by fine grained tannins and a supple feel that carries into the distance. 14.3% alcohol.